Tyler’s new album Next In Line will be released in February 2018 through the VizzTone label group and Redeye Worldwide distribution. 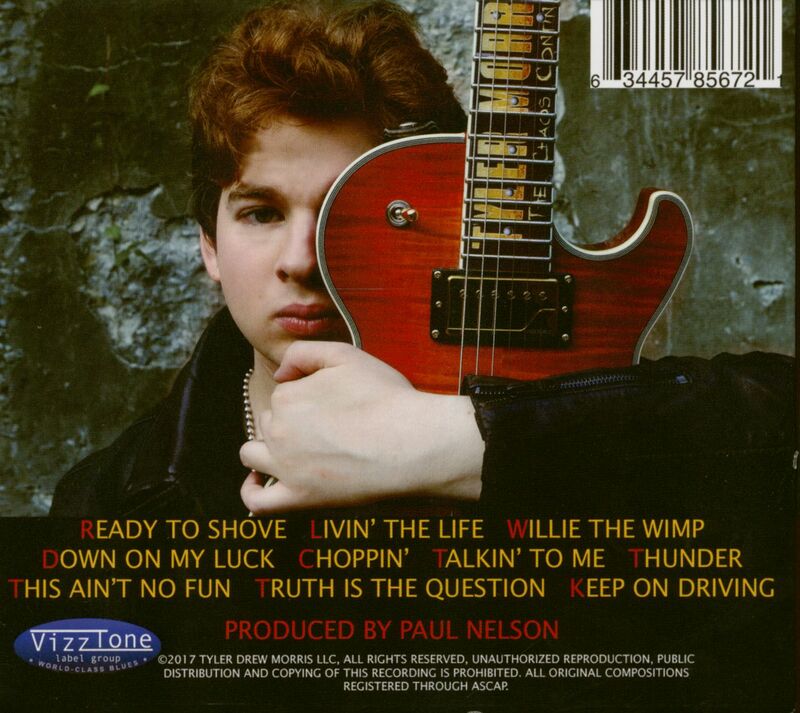 For this album, Tyler worked with Grammy Award-winning producer Paul Nelson (Johnny Winter) and incorporated guest appearances by Joe Louis Walker and the Uptown Horns. Tyler continues to develop his signature sound - channeling a classic Blues mindset into modern Rock phrasing and syncopation. He is very aware of the melding of styles as he references a combination of phrases from Freddy King and Aerosmith’s Brad Whitford in his soloing on one song, and draws strong inspiration in others from Ritchie Blackmore, Joe Perry, Eddie Van Halen, Johnny Winter, and Joe Walsh. 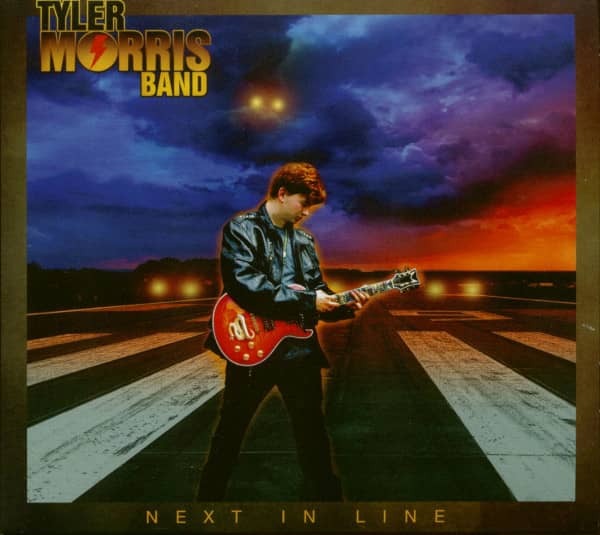 Tyler Morris has been playing guitar at a professional level since he was 11, and at the ripe old age of 19 is about to release his third album internationally. But Tyler is not just another young musical genius - his gift runs deeper than an amazing set of ears paired with two very skillful hands. Ever since he picked up a guitar, Tyler has been driven to get to the roots of the songs and styles he learns and absorbs, and to reflect his huge and growing body of influences onto his own interpretations and eventually, his own compositions. Thanks to his father’s music collection, Tyler developed an affinity for Blues and Rock music around the age of 6, and settled on guitar as his primary obsession at 9. He would work on songs by Eric Clapton, Aerosmith and B.B. King until he could do a faithful rendition of the originals, his focus moving from Rock to Blues and back again, exploring AC/DC, Lynyrd Skynyrd, and Led Zeppelin. Tyler then turned to Van Halen, learning their catalog and channeling that style so thoroughly that he was later featured in a blazing tribute video to Eddie Van Halen’s technique for Vintage Guitar magazine. After a few years, Tyler turned his attention to more classically rooted Rock musicians such as Deep Purple/Rainbow’s Ritchie Blackmore, Yngwie Malmsteen, and Jason Becker, and also became interested in Andy Timmons, Gary Moore, Bon Jovi and Journey. At that point Tyler came back to the Blues, digging deeper this time. He began to learn entire catalogs of songs from Freddie King, Albert King, Muddy Waters, T-Bone Walker, Little Walter, Lonnie Mack, Junior Wells, Johnny Winter and others. Soon he started consuming the more modern Blues of Stevie Ray Vaughan and Jimi Hendrix as well. Tyler then took this huge body of knowledge, took a sharp left turn, and began to apply it to the task of deconstructing Aerosmith’s catalog. Along the way Tyler became a strong, prolific songwriter, and a performer. Tyler has always enjoyed playing onstage. At the age of 11 he started playing in the clubs around his home near Boston, MA. When Tyler was 12, he was trying out a guitar at a Guitar Center in West Palm Beach, Florida where he happened to be heard by Gary King, musical director of the band at the local B.B. King’s Blues Club. That night King recognized Tyler in the audience and called him onstage; the crowd went crazy, and Tyler became a regular guest player at the club. Since then he has had the opportunity to perform with legends and heroes including Sammy Hagar, Yngwie Malmsteen, Leslie West, Mark Farner, Ronnie Montrose, Robben Ford, Kip Winger, James Montgomery, Gary Hoey, Zakk Wylde, and many more. He has recorded with Eddie Kramer, and played at venues and events including The Baked Potato, the Guitar Gods Festival, Axes and Anchors Cruise, The Hollywood House of Blues (Sunset Blvd. ), Gibson Hollywood Showroom, Bethel Woods Woodstock Performance Center, The Cutting Room in Manhattan, B.B. King’s Blues Clubs in West Palm Beach and New York, The Hard Rock Cafe Boston, Tupelo Music Hall, the Miami Beach Bandshell as well as many other places in and around Boston. Kundenbewertungen für "Next In Line (CD)"